It is that time of year once again! THE 11th ANNUAL MOTOR4TOYS CHARITY CAR SHOW AND TOY DRIVE! The Porsche community has always supported Motor4toys in a huge way! I am hoping this year will be the biggest and best yet! What is new for this year? We are doing a Supercar Corral. We have full support from just about every Exotic Car Club in the state as well as cars coming from outside of California! Our presenting sponsors are: The Auto Gallery, Fiat North America and Coastline Motorsport. The Auto Gallery, who has been hugely supportive of Motor4toys is pulling out all stops this year. Each of their locations will be a rally point the morning of Motor4toys. They are also assisting with video production, social media, outreach, and PR. Thank you Auto Gallery! I will have more info on the rallying locations as we get closer. The Supercar Corral: We are expecting hundreds of exotics. Yes, HUNDREDS. If you are new to Motor4toys, all we ask is for unwrapped toy(s) for needy children. That simple. With the help of our community, we have collected millions of dollars of toys over the last 10 years. The Goal: A total of 60,000 toys through the entire month of December! The toys collected from the day of the event will be going to Children's Hospital Los Angeles. I hope that we can collect 10,000 toys the day of the car show which will be unbelievable, but we need your support to do it! The day of the event…get there early and please bring toys! Please invite your friends, family, co-workers, car club friends….and ask them to pick up some toys as well. 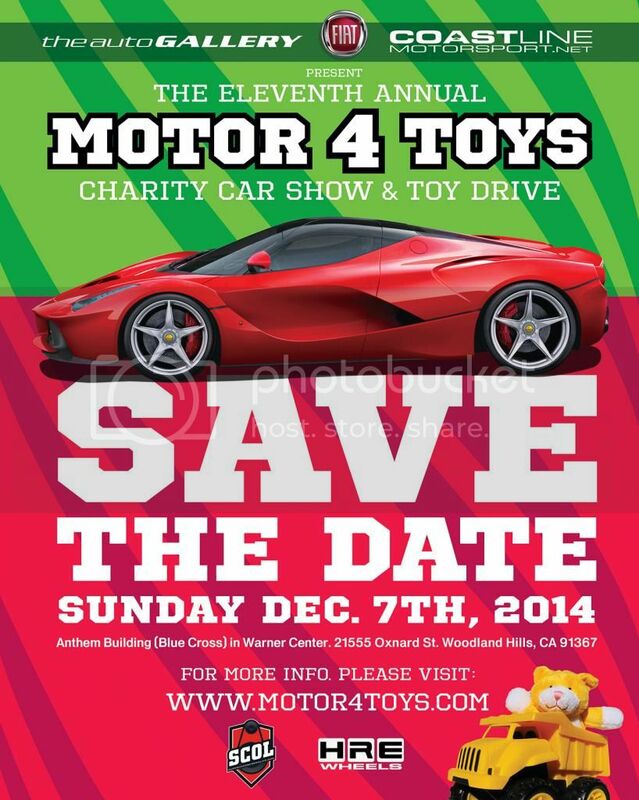 As most of you know, Motor4toys is a recognized 501(c)(3) and 100% of the proceeds go to help kids. There are no salaries…we do this…to do it. Thank you all for your years of support! See you there and as always, please RSVP below!